Bismuth is one of the easiest and prettiest metal crystals that you can grow yourself. The crystals have a complex and fascinating geometric hopper form and are rainbow-colored from the oxide layer that quickly forms on them. Follow these step-by-step instructions to grow your own bismuth crystals. You have a few options for obtaining bismuth. You can use non-lead fishing sinkers (for example, Eagle Claw makes non-lead sinkers using bismuth), you can use non-lead ammunition (the shot will say it is made from bismuth on the label), or you can buy bismuth metal. Bismuth is readily available from online retailers, such as Amazon. Although bismuth is much less toxic than other heavy metals, it's not exactly something you want to eat. If you use steel measuring cups, it would be best if you only used them for the bismuth project and not for food. If you don't have aluminum cans or are concerned about the plastic coating often found on cans, you can fashion a bowl from aluminum foil. The quality of crystals you obtain depends in part on the purity of the metal, so make sure you are using bismuth and not an alloy. One way to be certain of the purity is to remelt a crystal of bismuth. It can be used over and over again. Otherwise, you'd do well to read product reviews from a supplier to learn whether or not the product is pure enough for crystallization. Place the bismuth in one of your metal dishes and heat it over high heat until it melts. It's a good idea to wear gloves since you are producing a molten metal, which is not going to do you any favors if it splashes onto your skin. You'll see a skin on the surface of the bismuth, which is normal. Preheat the other metal container. Carefully pour the melted bismuth into the heated clean container. You want to pour the clean bismuth out from under the gray skin, which contains impurities which would negatively affect your crystals. Set the clean bismuth in its new container on a heat-insulated surface (e.g., set the container back on the burner, but turn the power off). 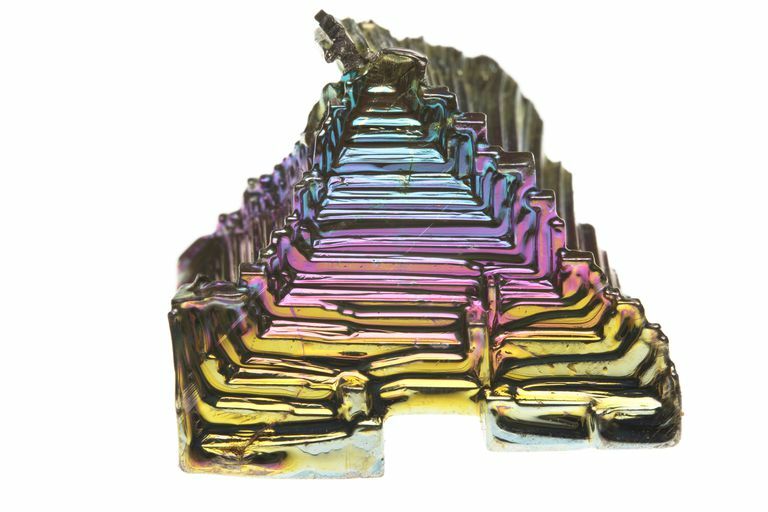 The cooling rate of the bismuth affects the size and structure of the resulting crystals, so you can play with this factor. Generally, slower cooling produces larger crystals. You do not want to cool the bismuth until it is solid! When the bismuth has started to solidify, you want to pour the remaining liquid bismuth away from the solid crystals. This happens after about 30 seconds of cooling. You can tell it is about the right time to pour the liquid away from your crystals when the bismuth is set, but has just a little jiggle to it when jarred. Sounds scientific, right? Once the crystals have cooled, you can snap them out of the metal container. If you are not satisfied with the appearance of your crystals, remelt and cool the metal until it is just right. If you have trouble getting the bismuth crystal out of the container, you might try remelting the meta and pouring it into a flexible silicone rubber container. Be aware silicone is only good up to 300 °C, which is just barely above the melting point of bismuth. You need to melt the metal in one container and be sure it has cooled enough to start solidifying before transferring it to the silicone.